Kastellorizo or Castellorizo is a Greek island and municipality located in the southeastern Mediterranean. It lies roughly 2 kilometres off the south coast of Turkey, about 570 km southeast of Athens and 125 km east of Rhodes, almost halfway between Rhodes and Antalya, and 280 km northwest of Cyprus. Kastellorizo is part of the Rhodes regional unit. The island has become more popular in recent years among tourists looking for an isolated place in the Dodecanese, thanks also to the 1991 Oscar-winning movie Mediterraneo, by Gabriele Salvatores, which is set on the island during the Second World War. 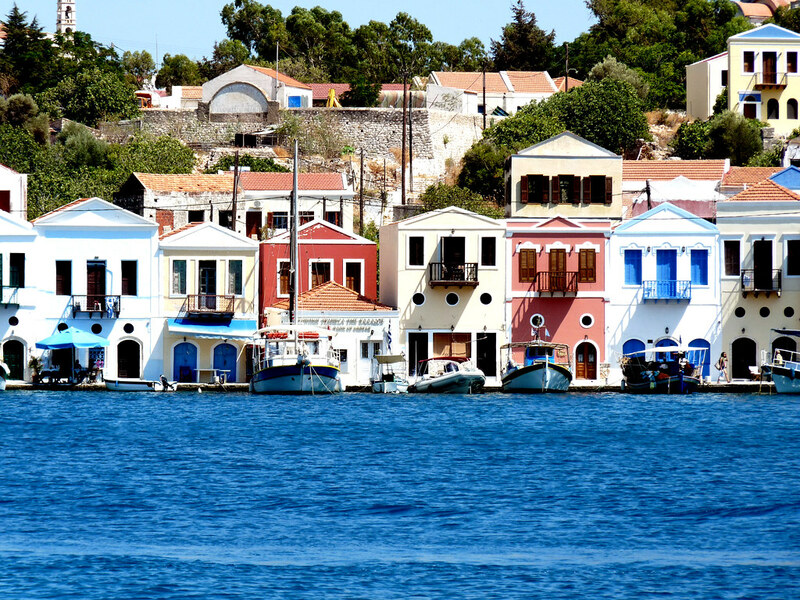 Kastellorizo is the easternmost Greek island and is situated in the Levantine Sea. It lies about 2 km from the Anatolian coastal town of Kaş, more or less halfway between Rhodes and Antalya. Cyprus is about 280 km to the south-east. It is six kilometres long and three kilometres wide, with a surface of 9.2 square kilometres. It has a triangular shape, and is oriented from NE to SW. The island features three capes: Agios Stefanos, Nifti and Pounenti; between the first two there is a wide and accommodating bay, the island's main harbor, where one finds the only town on the island. Cape Agios Stefanos, the nearest to Anatolia, is 2250m south of the modern Turkish town of Kaş. Cape Nifti lies some greater distance from the Anatolian coast. The island is mountainous, with high and steep coastlines, which become more difficult to access moving west. The soil is composed of limestone and produces only small amounts of olives, grapes and beans. On the island there is no source of drinking water. The Municipality of Megísti includes the offshore islands of Ro and Strongyli as well as several smaller islets. It has a total land area of 11.978 square kilometres. The blue markers shows the location of various accommodations in Kastelorizo. The letter in the marker describes the accommodation types: H for Hotel, A for Apartment, R for Resort, B for Bed & Breakfast and O for Other (e.g. pension, villa). Click on the blue marker for more information on the accommodation.